US Cover Proof for ECHO! Well, the art department chose a different background color than the one I’d suggested–but they did a wonderful job with the caltrop! And over all, I think it’s quite striking, and in keeping with the rest of the series. I think it’s a great cover. Strong and mysterious, it looks like a promise of something good and special. Counting the days and eating my nails till I open that book, smell it’s pages and start to unfold the future of my beloved couple. Diana, just a question I’ve been dying to ask. Will we find out how Jamie knows that Amanda is a ‘fiesty, wee baggage’ in ‘Echo’? Btw, I’ve turned my cousin in Cali on to your books. I did not wait for her to get it, I sent it to her. She’s hooked now. Oh, and the friend I’ve turned on to your books begs that you not leave the last book with Jamie and Claire dying. I have no idea, but I hope so. Oh, I’d suggested a deep wine color–a dark pinkish red. I think they were right to go with the black, though; it’s _very_ striking! You know, I’m expecting in September and it would be wonderful to be able to read the book while recovering from my scheduled c-section. (Blood and Ashes saved my sanity with my first born a couple years ago.) Can’t wait for it to come out! If I remember correctly , Diana, the colour you chose for the cover was a midnight blue …that’s my choice too. I think the publishers black cover is striking and certainly solemn. However, black tends to focus the viewers imagination rather narrowly whereas a midnight blue can guide an imagination into infinitely more possibilities. But, heck … you like it ok, it works for you ok, it ain’t broke. And if it ain’t broke don’t fix it(at this stage)! 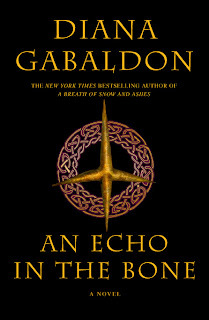 The cover is beautiful Mrs. Gabaldon, but I must admitt I did think chicken’s foot when I first saw it. What is a “caltrop”? The color is so beautifully striking and the design is magnificent! I have read Outlander probably near a hundred times and have just recently purchesed all 6 books :)all of the covers have been gorgous and colorful and have had really neat designs! AND i will be going to MI this May to get Outlander signed by none other than Diana herself!! !